Through this brief introductory course, we have been plotting single plots. Multiple plots within the same figure are possible - have a look here for a detailed work through as how to get started on this - there is also some more information on how the mechanics of matplotlib actually work. To give an overview and try and iron out any confusion, let’s run a quick example. This adds a subplot to the figure object and assigns it to a variable (ax1 or ax2). The numbers - for example 121 - are a way of locating your subplot in the overall space of the figure object. The code 121 can be though of as 1 row, 2 columns, 1st position. 122 would therefore be 1 row, 2 columns, 2nd position. 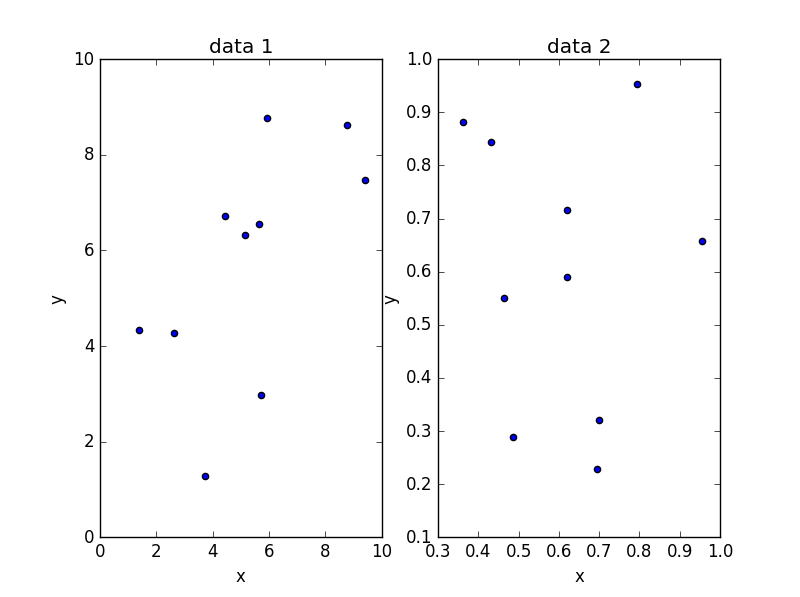 By defining separate axis objects, we can modify the diofferent plots specifically. Note that we are calling the data using numpy’s indexing (look at the numpy indexing course notes here). Have a play in the interactive plot window that opens up where you can move your data around - this also provides some options for savimng your figure. You can also save the figure (but this must be done before calling plt.plot()) using the plt.savefig() function.